I had never seen Keffir limes or their leaves before my first Thai meal, at Krung Thai (the original location), in San Jose. But once I got a taste of Thom Ka Gai and those unusual and fragrant leaves, well, I was hooked. I discovered, very happily, that the OSH near my house had a Keffir lime tree, and I snatched it up. As you can see in the photo below, the leaves are sort of double, like two leaves stacked end-to-end. And the perfume! If I ever find a Keffir lime essential oil, I will buy it by the gallon. The classic use for the leaves and juice, for me, is Thom Ka Gai, a soup also made with coconut milk, lemon grass and, in this case with chicken (Gai), although you can also use prawns (not sure of the Thai word for that). Here's a recipe for a Thai fusion risotto, using that soup as the liquid. It's a little unusual, perhaps, but it makes a wonderful dish. If you've never made risotto, here's brief description of the process. This is one of the things I use my StirChef for. It's an energy saver, mine. FYI, here's a photo of the limes themselves. They have a wrinkeld, ridged brain-like look to them. These are green, in the sense of being unripe. When ripened, they are a color similar to key limes. Their juice seems very sour to me, but I've never had straight lime juice from regular limes, so I can't really compare them. They smell like heaven, though. I love the smell and taste of this. My step sister lives in California and she sends me the leaves from her tree once in a while. You are so lucky to have a tree. All my citrus trees are in containers because I kept them up on the deck. So, you could probably grow one if you wanted. It's great being able to go outside and grab a few leaves. The one drawback, and this might be my lack of expertise, but the trees don't always put out much fruit. I've been meaning to get a Keffir lime to grow here in Davis, California. I never see this variety sold though. I guess I'll have to order it by mail. Yours looks beautiful! I've wanted to grow a Keffir lime here in the Central Valley of California for some time. I will have to order one because they don't have that variety of lime for sale here. Yours looks wonderful! I just made Tom Yum and would have loved to have three kaffir lime leaves. You are lucky and blessed to be able to get them. I just made Tom Yum and did not have access, how lucky you are to have one on the deck. I am jealous. P.S. I think it is kaffir lime. gia-gina, I've seen both spellings. I think it's one of those things where it depends on what transliteration system they use for a language that doesn't use our alphabet. I saw it with the "e" first, so I've just stuck with that. :G: You'll find a lot under both spellings when you Google it. I'm also one of those people who spell yog(h)urt with an "h". In case anyone's wondering why all the deleted comments, I've been trying to figure out what happens if I reject a comment on moderation. Unfortunately, since I'm the blog owner, my comments don't go to moderation. I've gotten a couple of duplicate comments sitting in my moderation queue, and I'm afraid to reject them for fear the poster will be told their comment was rejected, when it was only a duplicate I want deleted. Eeek! I'm always delighted to find others who have a passion for Kaffir Lime like I do! There's all the difference in the world between fresh leaves and the dried kind. 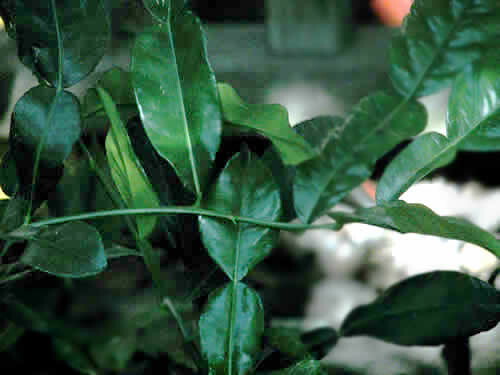 You can have fresh Kaffir Lime leaves delivered to you from a place in Arizona by emailing: EmmysGarden@gardener.com They always arrive fresh.